The Dornier Do X was the largest, heaviest, and most powerful flying boat in the world when it was produced by the Dornier company of Germany in 1929. First conceived by Dr. Claude Dornier in 1924, planning started in late 1925 and after over 240,000 work-hours it was completed in June 1929. It was initially powered by twelve 524 hp Siemens Bristol Jupiter radial engines in tandem mountings with six tractor propellers and six pushers mounted in six strut-mounted nacelles above the wing. It was launched for its first test flight on 12 July 1929. After completing 103 flights in 1930, the Do X was refitted with 610 hp Curtiss V-1570 "Conqueror" water-cooled V-12 Vee engine. 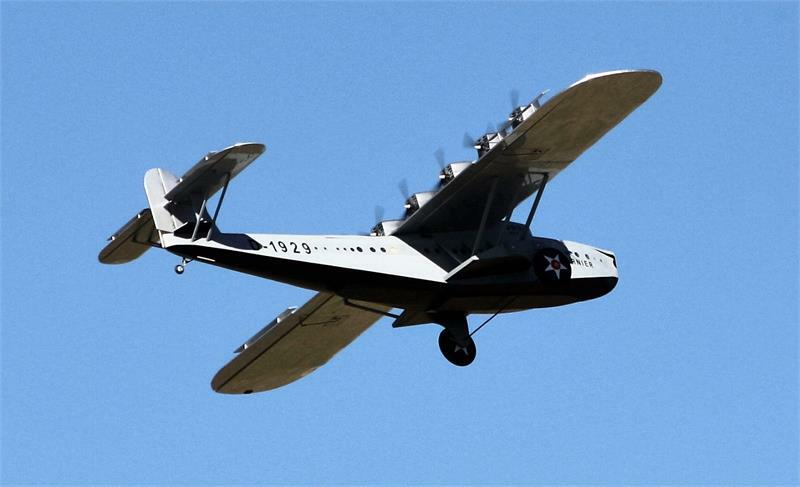 Dr. Dornier designed the flying boat to carry 66 passengers on long-distance flights or 100 passengers on short flights.The luxurious passenger accommodation approached the standards of transatlantic liners. There were three decks. On the main deck was a smoking room with its own wet bar, a dining salon, and seating for the 66 passengers which could also be converted to sleeping berths for night flights. Aft of the passenger spaces was an all-electric galley, lavatories, and cargo hold. The cockpit, navigational office, engine control and radio rooms were on the upper deck. The lower deck held fuel tanks and nine watertight compartments. The DO-X lacked conventional wing floats, instead using fuselage mounted "stub wings" to stabilize the craft in the water, which also doubled as a embarkation platform for passengers. To introduce the airliner to the potential United States market the Do X took off from Friedrichshafen, Germany on 3 November 1930 for a transatlantic test flight to New York. The route took the Do X to the Netherlands, England, France, Spain, Portugal, South Africa and Brizal. Then the original Do X was turned over to Deutsche Luft Hansa, the national airline at that time, after the financially strapped Dornier Company could no longer operate it. After a successful 1932 tour of German coastal cities, Luft Hansa planned a Do X flight to Vienna, Budapest, and Istanbul for 1933. The voyage ended after nine days when the flying boat's tail section tore off during a botched. While the fiasco was successfully covered up, the Do X was out of service for three years, during which time it changed hands several times before reappearing in 1936 in Berlin. The Do X then became the centerpiece of Germany's new aviation museum Deutsche Luftfahrt-Sammlung at Lehrter Bahnhof. The Do X remained an exhibit until it was destroyed in an RAF air raid during World War II on the night of 23–24 November 1943. Fragments of the torn-off tail section are on display at the Dornier Museum in Friedrichshafen. While never a commercial success, the Dornier Do X was the largest heavier-than-air aircraft of its time, a pioneer in demonstrating the potential of an international passenger air service. This 1/20 RC Dornier Do X project was kicked off in late 2013 and released in late November 2016. It powered by 12 electric motor, flying weight around 23-25 lbs. Landing gear is optional. Wing Loading ................................................................................................. 34.9 oz./sq. ft.
True-to-scale multi-engine power system with six pylon-mounted nacelles. Balsa and plywood construction semi-scale model of this unique and historic golden-era aircraft. Major assemblies are preassembled and prepainted or precovered in Mylar. True-to-scale “bench” surfaces on the tops of the ailerons and elevators. Hatch on each engine nacelle. Hatch on nose for easy access to batteries and radio-system switch. Hatch on rear turtledeck for water-rudder servo installation and mantainance. Capability for optional land operation. Designed for electric, but may be converted to glow.